How do you start with a good financial prognosis for your company? This is a question often asked by startups, especially when a lender has to be convinced. The answer: start from your Business Model Canvas. Your BMC and your financial plan are essentially two sides of the same coin. Follow the next simple 6 steps (out of 9) to learn how to start your financial prognosis, with nothing more than your Business Model Canvas (BMC). As an example, we take a fictitious company cola brand X and let’s call this brand Happy Cola. 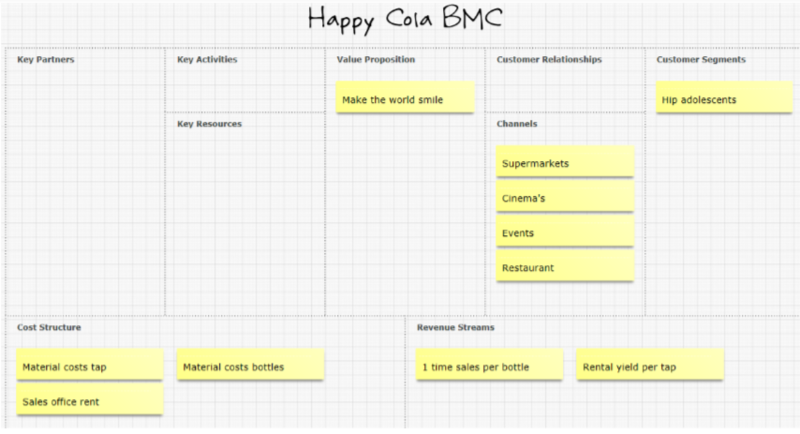 The value proposition of Happy Cola is: &#39;Make the world smile!&#39;. How does this proposition affect the financial plan? It implies that Happy Cola wants to have a large customer range (&#39;the world&#39;) and likes to be associated with and seen with / during moments of happiness and joy (&#39;smile&#39;). You will see that this has an impact on the costs and revenues you can expect. Based on the value proposition you not only determine the context for the BMC, but also for the financial plan. 1. Liter bottles for the range via supermarkets. step now is sales targets! For your financial plan, it is important to clearly define your customer to know the size of your market and then to make a sales target with that knowledge. Back to the example: Happy Cola has decided to focus mainly on hip adolescents. Because what appears? Happy Cola&#39;s market research shows that there is a great need for a new type of cola in the urban agglomeration. Young people in the urban agglomeration are desperately looking for a new cola brand, as currently only Pepsi and coca cola is sold. The area currently sells 10 million liters of cola to adolescents and Happy Cola wants to get 10% of that market in the coming year. The company estimates to be able to sell cola in 600,000 liter bottles and also 400 taps, each of which accounts for 1,000 liters of cola per year. By making a business model, a turnover forecast can be drawn up. To determine your business model, ask yourself two questions: 1) how do you earn money (renting, leasing, one-off sales, subscription, etc. ); and 2) what price do you ask for the products / services you sell? It works as follows for Happy Cola. The company sells liter bottles for € 1 each as a one-off sale via supermarkets. In addition, it offers cola-taps for restaurants, cinemas and event agencies for € 1,200 per year on the basis of a 5-year lease contract. 2) what are the costs that you incur, regardless of how much sales you are running (the fixed costs)? Happy Cola, for example, has to take into account € 0.50 of purchased plastic per bottle. Material costs for the taps (purchased plastic and metal) are € 400 per tap. The more taps and bottles of Happy Cola sell, the more plastic and metal it needs to buy. These costs are therefore variable costs. Happy Cola also leases a large sales office in the urban agglomeration and pays € 50,000 per year for this. These are fixed costs: whether Happy Cola sells 0, 100,000 or 1,000,000 liters of cola, the rent will have to pay the company anyway. There you go! We have just made a global financial forecast for Happy Cola for next year as shown in the table below! What are Circular business models actually, and what types do you have?